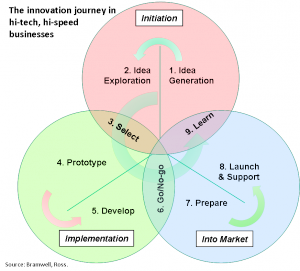 What’s critical in the innovation journey? W hat are the critical practices that businesses need to apply in their innovation journey from ideas to products generating value in the marketplace? This is the question we decided to try and answer at the end of 2009. For it is a key question for businesses wanting to improve their innovation effectiveness and therefore their ‘hit-rate’ for creating successful new products. We have now completed our initial study on 25 medium to large technology businesses based in the UK and Denmark. We were greatly aided in this work by our collaborating partners: The University of Exeter Business School, Aalborg University Denmark and Gill Jennings and Every (GJE). Our study used our three phase model of the Innovation Journey, an end-to-end conversion of ideas to value (see diagram). 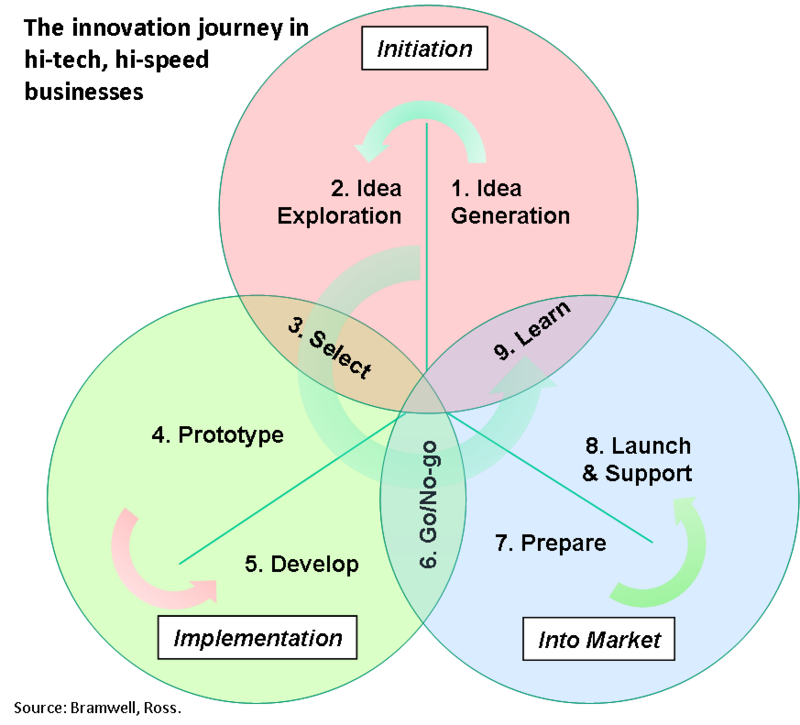 The model explores the three phases of ‘Initiation’ (Idea generation, Exploration, Selection), ‘Implementation’ (Prototyping, Development, Go/No Go) and ‘Into Market (Prepare, Launch & Support, Learn). We developed a detailed 80 question assessment to explore these practice areas and compare them against the participating companies’ innovation performance. This enabled the individual practices with the strongest correlation with innovation performance to be identified. Our study found that the innovation practices in our defined innovation journey correlated significantly with the innovation performance of the 25 participating companies – which means that those companies that had superior innovation practices achieved higher innovation performance. We also selected the top 1/3 of the participants based on their measured innovation performance and defined them as the ‘Innovation Leaders’ and compared their practice scoring with the others, so that we could determine which areas of the innovation journey were of most importance. We identified three areas where this Leader group were significantly superior to the others in their innovation practice, indicating that these areas were more critical to the achievement of superior innovation performance than the others. These were: Idea Exploration, Market/Launch Preparation and Intellectual Property Management. Those areas which traditionally are considered most important – such as the Development step – showed little difference between the innovation performance leaders and the others. It is interesting to note that it is the ‘front and back ends’ of the innovation pipe which seem to be most critical i.e. the exploration of ideas prior to entry into the pipe and the preparation of the resulting product exiting the pipe for market. IP Management was shown to be strongly correlated with innovation performance. We believe that this is primarily an outcome of being an effective innovator – you need to effectively exploit your IP. One other marked overall difference between the leader group and the others, was that the leaders showed much more user focus throughout the journey. We believe this is key to ensuring that developed products are strongly user-influenced, rather than simply technology-driven. To enable a successful user-focused innovation approach, but also to create significant innovation, effective techniques need to be applied to determine user value (such as ‘user anthropology‘ or ‘lead users’). We will be publishing the study report by the end of February. Participating companies will receive a copy of the report and their individual (anonymised) scoring against the other participants and the innovation journey model. We are seeking to expand the study database size and also intend to use the assessment tool developed from this study to help businesses improve their innovation effectiveness. You are currently browsing the Codexx blog archives for February, 2011.